My friends, I have not been the best blogger this year. I started out well but my productivity dropped off when real life stepped up with a few stresses and challenges. Consequently, I've ended up with a nice stack of books that haven't been reviewed. I want to at least mention the books because many of them are fantastic. 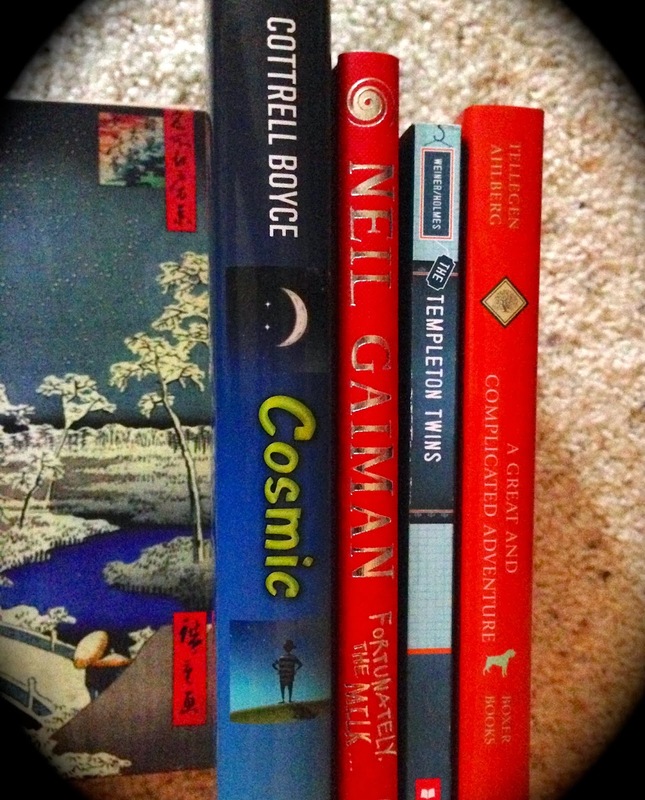 I also want to put this stack of books away and start fresh in the new year. 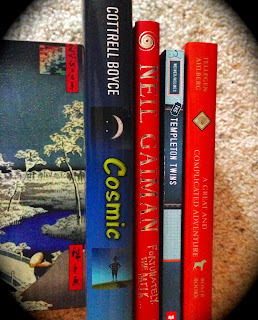 So bear with me as I take you on a whirlwind tour of a dozen or so books! Cosmic by Frank Cottrell Boyce was a super fantastic book about a twelve-year-old boy, Liam, who pretends he's an adult (he looks old for his age) and ends up lost in space with four other children. This book is his attempt to explain how he got there. Z and I both loved this book. It's very British and also very engaging. Fortunately, the Milk by Neil Gaiman, illustrated by Chris Riddell (in the UK), was hilarious and also very British since I ordered a beautiful slipcased edition (signed by both author and illustrator) from Foyle's Bookstore and had it shipped over the pond! Though the book was a little young for Z, he didn't mind one bit. Personally, I loved how Riddell made the dad look like Neil himself. The Templeton Twins Have an Idea by Ellis Weiner, illustrated by Jeremy Holmes, was a fun enough read but it never quite grabbed Z's interest. There is a saucy narrator that just seemed to annoy him though I'm sure other kids would find that voice hilarious. I loved how the kids each used their own individual talents to their advantage. A Great and Complicated Adventure by Toon Tellegen, illustrated by Jessica Ahlberg and translated by Martin Cleaver, is a book of very short bedtime tales that were originally published in Dutch. I read them quickly on my own one afternoon and ended up perplexed but amused. The stories are quite strange and yet I had one or two kids come immediately to mind who would probably enjoy them immensely. 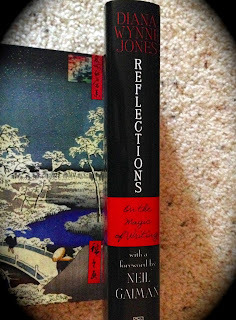 I finally finished Reflections: On the Magic of Writing by Diana Wynne Jones, which I began during DWJ March. I savored this book all year long and learned so much, both about DWJ and about storytelling. And, of course, a highlight of my year was having the foreword signed by Neil Gaiman. Under My Hat: Tales from the Cauldron, edited by Jonathan Strahan is a wonderful collection of witch stories. I was pleasantly surprised by the diversity and quality. There was only one story I didn't enjoy. The ones I loved most were from Diana Peterfreund, Garth Nix, Patricia A. McKillip, Tim Pratt, Isobelle Carmody, Jim Butcher and Peter S. Beagle. Close on their heels were tales by Charles de Lint, Neil Gaiman, Ellen Kushner, Jane Yolen and Margo Lanagan. As you can see from the names, this is a star-studded collection! 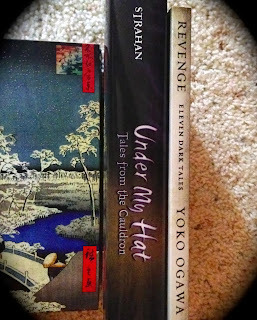 Revenge: Eleven Dark Tales by Yoko Ogawa was a read-together with Natalie but she also had real life get in the way and so we never got the chance to write about these strange and definitely dark tales. The word "disturbing" pops up more than once in the blurbs on the back of the book and it's a fantastic descriptor. I also used the word "creepy" in my notes. The stories begin as separate entities but then start weaving together in big and small ways. I found my biggest confusion arose from the question of gender in many of the stories. There weren't enough clues and many times I was reading the story from the wrong gender perspective until sometime near the end when it was revealed clearly. It was very disorienting and I'm not sure if that was purposeful on Ogawa's part or if it was a consequence of translation. 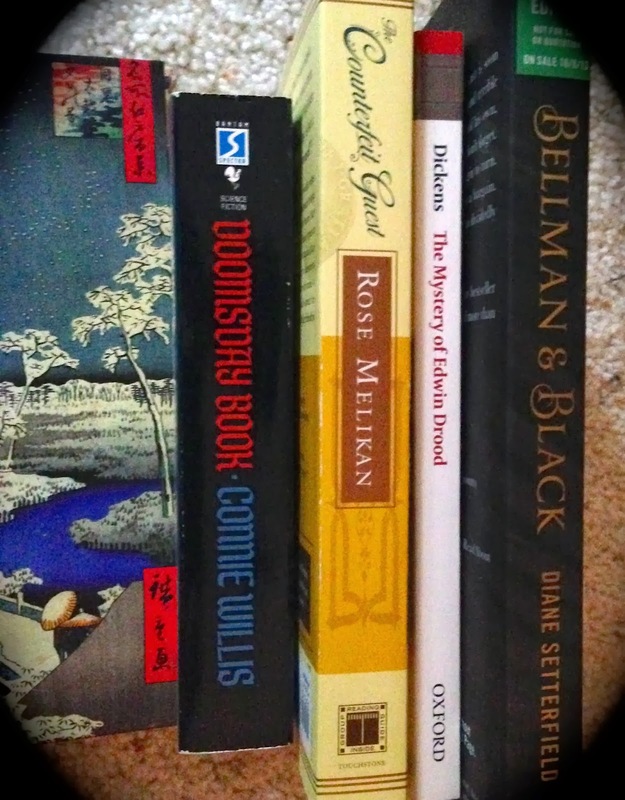 Doomsday Book by Connie Willis is another of her time travel "series" (in quotes because they really all are perfect stand-alone books with only brief reference to the other adventures and some character sharing). This was a trip back to the Middle Ages and it was amazing but long. It's my least favorite of the time travel novels but probably only because the others are set in times that I know more about. The Counterfeit Guest by Rose Melikan is also a series book but would work well as a stand-alone. It's a fun adventure/mystery with a strong female lead and a wee bit of romance. If you want to start at the beginning, the first book is The Blackstone Key. The Mystery of Edwin Drood by Charles Dickens is only half of a story and though I thoroughly enjoyed it, I felt out of sorts for days after finishing it. I finally realized that it was because I was annoyed at not being able to continue with the story! I think that Dickens wrote some of his most complex characters for this novel and his pacing was perfect. It is a tragedy that he never finished writing the story. Bellman and Black by Diane Setterfield is one I purposefully avoided reviewing. I just don't know what to say about it. It was okay but not great or memorable in the way that her first novel was. The Grey King and Silver on the Tree by Susan Cooper were the last two books in the Dark is Rising Sequence. The Grey King was amazing and made me want to travel to Wales immediately. Silver on the Tree suffered a bit from my timing in picking it up, being the book that I read over the Christmas holiday. I was busy and it took longer than it should have and so I kept losing track of the story. Still, I think this was an amazingly deep and complex series and I truly hope that Z enjoys it in the coming years. Seventy-Seven Clocks by Christopher Fowler is the third Peculiar Crimes Unit Mystery though these are books that could be read on their own as they skip around in time. This one takes place in the middle of Arthur Bryant and John May's careers -- 1970's London. It was a crazy roller-coaster story of murders and phobias and I am definitely looking forward to picking up the next book. 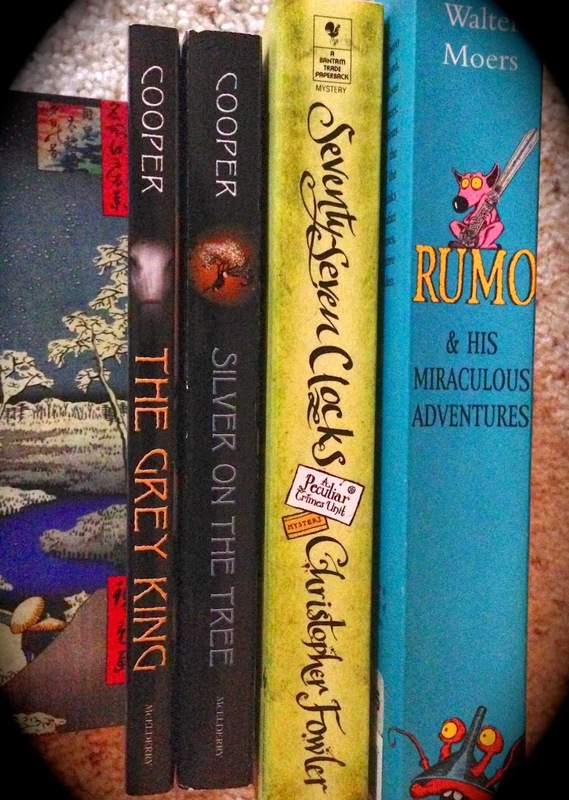 Rumo & His Miraculous Adventures by Walter Moers is the second Zamonia book and I put off reading it for a long time because Rumo was not a very exciting character in the first book. That was a mistake because this book was fantastic. I don't even know how to begin to explain this book or series but if you are looking for something completely different, this is it. If you don't enjoy the absurd or fantastic, then don't read it. It's ridiculous, right? Some of these books were from the summer. I'm such a slacker! And this was my first Frank Cottrell Boyce but I really enjoyed it. I would gladly pick up another book of his. I know what you mean. I fell off the blogging wagon in 2013, too. It makes me sad. I haven't got around to even doing this despite wanting to! Kudos to you for starting fresh and getting all these reviews done in one post! I have Reflections on my wishlist! I really hope to read that one sooner rather than later! I think you would love Reflections, especially since she talks a lot about how myths found their way into her stories. Aw, thanks! I hope that our strange tastes end up working out for your kiddos. ;) And it's such a fun transition from picture books at bedtime because there's that sense of anticipation as you all wait for more of the same story the next night!